"[TUCKER], Content, d. Abraham [Abraham (s. Henry) and Hanna (second w.), C.R.3], Mar. 12, 1695." Vital records of Dartmouth, Massachusetts, to the year 1850 ( Boston, Mass. 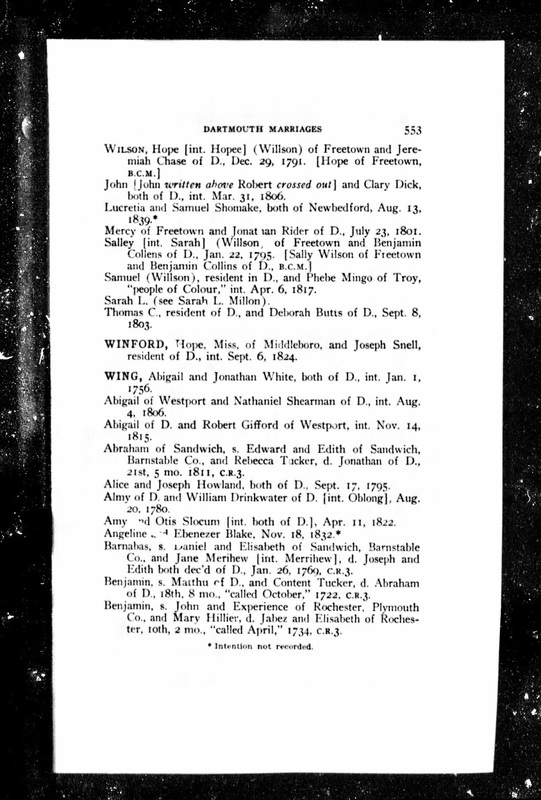 : New England Historic Genealogical Society,1929-1930), Births, page 285, Content Tucker entry, 1695. 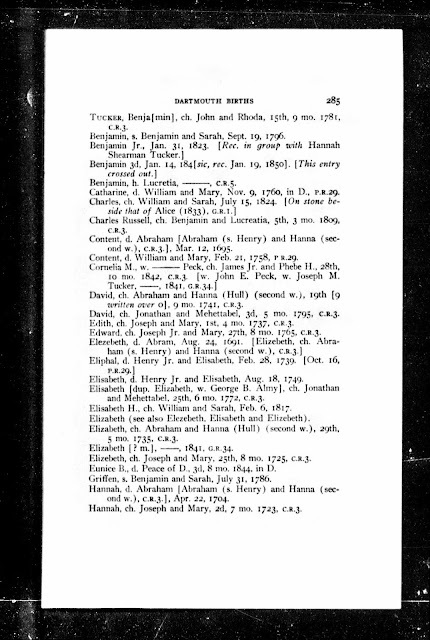 Content Tucker (1695-1738) of Dartmouth, Mass was born 12 March 1695 in Dartmouth, Massachusetts, the daughter of Abraham and Hannah (Mott) Tucker. She married Benjamin Wing (1698-1782), the son of Matthew and Elizabeth (Mott) (Ricketson) Wing of Dartmouth, Massachusetts.in 1722 in Dartmouth. This record for the birth of Content Tucker is a Derivative Source record, because it was copied from an earlier town and/or church record books. I did not find an earlier Dartmouth town record book in the Ancestry.com record collection. This record is from the church records of Society of Friends, Dartmouth Monthly Meeting (that is what "C.R.3" means according to the Dartmouth Vital Records book). Thanking you for what you do. Appreciating your examples of how we could and should be doing our research. Especially when we can also find a link to someone. Keep it up.